Stretches of green countryside speed by, the swift clouds chase across the sky, the asphalt is rapidly swallowed up, and then, all at once, everything goes dark. After more than ten kilometres in the belly of a mountain, suddenly there is light again and the majestic grandeur of the Gran Sasso is already behind you. Taking the Gran Sasso tunnel is a fascinating experience, but one tinged with anxiety. 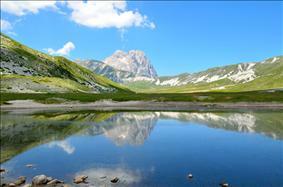 Man has challenged nature by crossing this part of Abruzzo as it straddles the Apennines, incorporating L'Aquila and Teramo. And Teramo is where our journey of discovery begins, in an area off the traditional tourist track and therefore particularly fascinating. This elegant town receives us with style in the beautiful Piazza Orsini, framed by a series of large monuments: the Palazzo Civico (town hall), the Cathedral of Santa Maria Assunta, its imposing bulk relieved by the soaring bell tower, the stately portico of the Palazzo Vescovile (Bishop's Palace) and the characteristic Fontana dei Due Leoni. Of great visual impact, as well as of considerable historical and artistic interest, is the Castello Della Monica, a nineteenth-century reconstruction of a medieval building. The province of Teramo is a banquet of delights, starting with Silvi, a small seaside town, known as the "Pearl of the Adriatic" for its beautiful silver sand beaches and a sea so crystalline you can see right to the seabed. If you're vacationing in Silvi in July, don't miss the Crafts of Yesteryear Fair, during which the streets of the town appear to have turned back the clock and are full of figures and customs borrowed from history. Close by is the famous seaside resort of Pineto, its name deriving from the pine forest beside the shore, planted in the early twentieth century by the Filiani di Atri family. Its beaches have been awarded the coveted "bandiera blu". A popular tourist attraction are Abruzzo's coastal towers, Pineto's beautiful Torre di Cerrano, one of the best preserved, is now a centre for marine biology. Nearby is the charming town of Colonnella, much admired by writer Ennio Flaiano. The prominent Torre dell’Orologio (clock tower) and the church of Santi Cipriano e Giustina are featured on every postcard of the town. No less impressive is the long stairway built in the 1900s, which connects via Roma to Piazza del Popolo and gives the profile of Colonnella volume and movement. Just seven kilometres away is the town of Controguerra, known for its vineyards and famed wine production. The medieval buildings gather around the 12th-century Castle with its great tower, while the Palazzo Comunale (town hall) holds a collection of interesting archaeological finds. There are many ways to get to know an area, but agritourism accommodation offers the full experience in the most genuine way, focussing on the scents, tastes and traditions of the area. The many agritourisms in the province of Teramo will be delighted to make your stay a way of getting acquainted, also by offering typical local dishes, from cardoons in broth to the delicious bocconotti pastries, stars of a cuisine once described as "poor", but today, synonymous with excellence and quality. The Gran Sasso National Laboratories (LNGS) are the research laboratories dedicated to the study of particle physics. They are the largest underground laboratories in the world, located 1,400 metres below the summit of the Gran Sasso massif, near the exit of the Gran Sasso tunnel on the Autostrada A24 Teramo - L'Aquila - Rome. Set up due to the efforts of scientist Antonino Zichichi, their construction began in 1982, together with that of the Gran Sasso tunnel. They contain the offices of the various groups that manage the experiments, a library, and conference rooms often used as a venue for meetings on scientific topics of global significance.